With this combination, I want to trade WSM from the long side. Williams-Sonoma, Inc. (WSM - Get Report) was upgraded today by TheStreet's Quant Ratings service. Regular readers of Kamich's Korner on Real Money probably know that I consider our Quant service a rich source of bullish and bearish ideas. Today's upgrade of WSM got me to take a look at the chart, which I will share with you. In this daily bar chart of WSM, below, we can see how prices have rallied since late August. Prices are now above the 200-day moving average line and the rising 50-day average line. There is some resistance above the market in the $54-$57 area but it could be test in the weeks ahead. The On-Balance-Volume (OBV) line has turned up with the latest price action and signals more aggressive buying. The Moving Average Convergence Divergence (MACD) oscillator moved above the zero line in early September for an outright go long signal. In this weekly chart of WSM, below, we can see that prices are above the flat to slightly rising 40-week moving average line. This chart suggests that a move above $56/$57 will be a significant breakout. The weekly OBV line has improved and the weekly MACD oscillator gave a cover shorts buy signal and is just below the zero line. 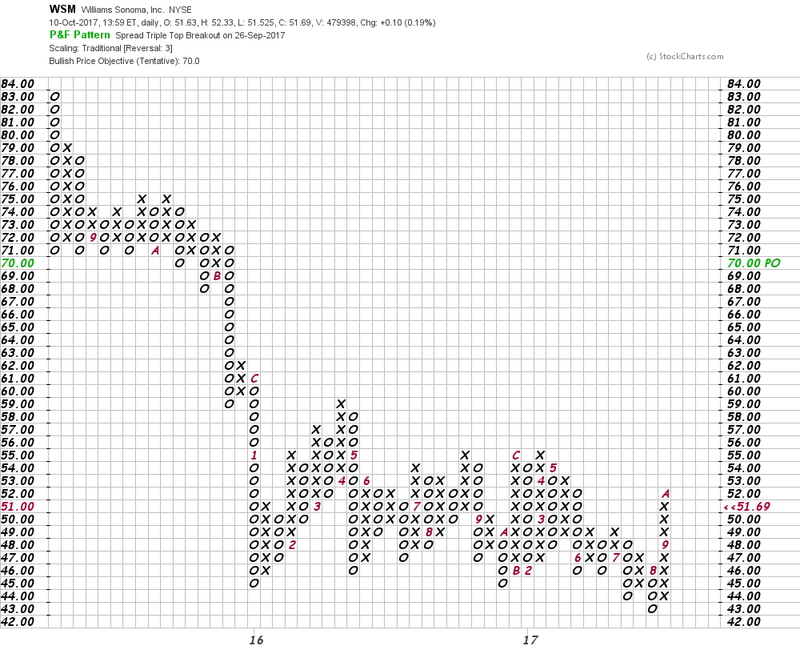 In this Point and Figure chart of WSM, below, we can see a large accumulation pattern and a $70 upside price target. Bottom line: With a quantitative upgrade and bullish charts I want to trade WSM from the long side. Aggressive traders could go long at current levels and add to longs above $56. Risk below $48 looking for gains to the upper $60s. Click here to sign up for Quant Ratings, where you can read our full report on Williams-Sonoma or more than 4,000 other stocks that our service rates in real time every market day. However, please note that our Quant Ratings service assesses stocks using a proprietary computer model that runs a variety of factors through quantitative and technical analysis. Ratings do not necessarily reflect the opinions of Jim Cramer or other columnists, who may use different criteria to grade stocks.